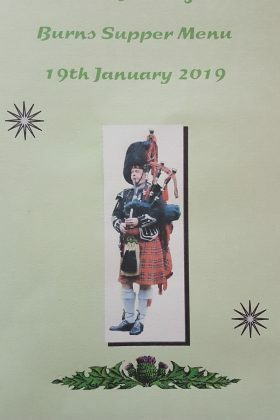 The first social event of the club’s year was the celebration, by some 60 plus club members, partners and friends, of Rabbie Burns the famous Bard of Scotland, who was born 260 years ago. A great Burns Night supper of Haggis and neeps or Steak Pie and veg was provided by our very own Dawn Saunders and her kitchen team. The traditional Haggis was ‘piped in’ by Will, a very able piper from Oundle School and the haggis was addressed by our special guest Bob Douglas who hails from Corby! After Bob’s reading of the Selkirk Grace we all tucked into a very enjoyable main course followed by a traditional dessert of cranachan or cheese and biscuits. Bob remarked that the haggis was the best he tasted in a very long time. This may have been due to the whisky flambe, which he had not experienced before! After the meal our club Vice President Richard Poole ‘toasted the lassies’ with a few taunts and quips. On behalf of the ‘lassies’ our President Margaret Walker responded with a description of Rabbie’s ‘frolicking’ behaviour during his lifetime and confirmed that unlike most men, he was, it seems, able to multitask. In addition to organising the event Joan Cavanagh and the social committee ran a raffle with quality prizes and a quiz to finish a very enjoyable evening.